If a user other than the current account Owner needs to manage the billing and account settings, it's best to transfer the account to them. There can be only one Owner in an account, but there can be multiple Admins. The Owner and any Admin can change the user level for an Admin to the Owner user level. An Admin can also change their own user level to Owner. In this article, you'll learn how to make someone else the Owner of the account. 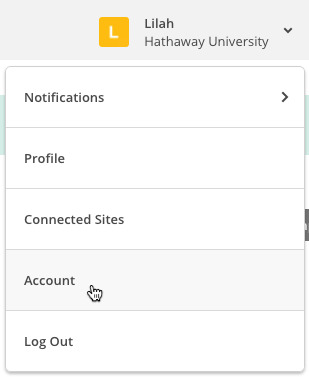 Click your profile name to expand the Account Panel and select Account. Click the Settings drop-down menu and select Users. Make sure someone besides the Owner is listed as an Admin for the account. If there is no Admin and only the current Owner is listed, invite the new Owner to access the account and assign them the Admin user type. The recipient must fill out their login information and accept your invitation before you can proceed. When you see the new Admin listed in the Users in your account section, click Edit beside their name. Click the Owner radio button. 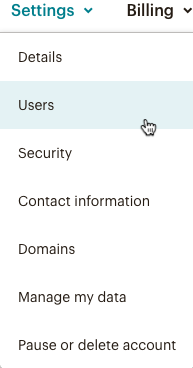 On the User details page, the Owner label now displays next to the new account Owner. Account Owners can't change their own user type, but they can assign an Admin as an Owner. When an Admin becomes the Owner, the previous Owner automatically becomes an Admin. The Primary Account Contact defaults to the account Owner. If you switch account Owners and you want to change your Primary Account Contact, you can do that from the Account settings page. Your account email address is the primary email used for billing, compliance, and important notices. Learn how to view and change your account email address.